Kenny Jackelen, the primary developer for baseball-reference.com, will be the featured speaker at the Halsey Hall Chapter 2019 Spring meeting on Saturday, May 18 at Faith Mennonite Church, 2720 E. 22nd Street in south Minneapolis. Registration for the meeting is at 8:30 with research presentations beginning at 9:00. A business meeting will be held during lunch with a Kenny Jackelen to follow and Howard Luloffs always-a-hit trivia contest. The cost for the meeting and lunch is $10. The meeting only is $5. Those wanting lunch must RSVP to Howard Luloff, 952-922-5036. Steve has just completed his book, Major League Lumber, and sent it to the publisher. He has also written Bob Oldis: A Life in Baseball. Baseball Diplomacy by Alan Holst, who recently retired fromt he foreign service and will talk of his baseball experiences with the State Department and how the the U. S. government promotes diplomatic relations through sports, specifically baseball. During the business meeting, the chapter will elect four members to a two-year term on the board of directors. Anyone interested in being a candidate may contact nominating committee chair Stew Thornley, 651-415-0791. One candidate for the board has stepped forward so far, Anders Koskinen. All candidates will be invited to submit a candidate statement to be published in the May 2019 newsletter. Those elected to the board will be part of the chapter board meeting on Sunday evening, June 9 and will elect officers (one-year terms for president, vice president, treasurer, secretary) from among the new and holdover members for 2019-2020. Jim Cox has come up with a way to make the chapter meeting even more special: valuable door prizes. He will lead a drawing to give a baseball-related gift to one new member (joined in the last 12 months) and one veteran member (more than a year). Members will note their status (new or veteran) on the attendance list when checking in. The drawing will be held during the lunch break. You must be present to win. Hamms Beer and some other beverages will be available, but bring your own if you want along with chips and other snacks to share. The fall chapter meeting will be Saturday, November 2. The Halsey Hall Chapter Research Committee will meet Monday, April 22 and Monday, May 20 at 7:00 p.m. at the Brookdale Library, 6125 Shingle Creek Parkway, Brooklyn Center 55430. All members are welcome to attend. The next Fred Souba Hot Stove Saturday Morning, an informal breakfast gathering for the purpose of talking baseball, will be at 9:00 on Saturday, May 4 at Bunnys Northeast, 34 13th Avenue NE, Minneapolis 55413, 612-545-5659 (in what was the keg warehouse of the Grain Belt Brewery). The Halsey Hall Chapter Book Club will meet Saturday, June 1 at 9:30 a.m. at the usual spot, Barnes & Noble in Har Mar Mall in Roseville. The book selection is Winning Baseball: A Simple Game of 10 by Les Gerdin, who will be present to talk about the book and answer questions. Winning Baseball is available through amazon.com. The chapter is organizing a trip to see the Clinton LumberKings play the Cedar Rapids Kernels at 6:30 p.m. on Saturday, July 27, and Emma Charlesworth-Seiler will be umpiring. Members may make their own carpool and rooming arrangements with one another. A suggested hotel for Saturday night is the Super 8, off Interstate 80 and 33rd Avenue, 400 33rd Avenue SW, Cedar Rapids 52404. The hotel is about three miles from the ballpark, and rooms are $55 to $60 plus tax. Call the Super 8 at 319-432-7282 to reserve a room. We will meet Emma for lunch around noon. Howard Luloff is contacting the Kernels to see if some of their staff can meet with us at the ballpark, and he may also have a trivia quiz. Howard will look into buying tickets in advance (a good idea since its fireworks night and may have a big crowd). Let Howard know if you will want tickets at hfan77@centurylink.net, 952-922-5036. The weekend of June 7-9 brings a trip to Milwaukee to see a Brewers-Pirates game on Friday night and then the Saturday afternoon unveiling of a statue for The Crusher in south Milwaukee, preceded by a quaffing of beverages at Sams Tap. Contact Stew Thornley, 651-415-0791, if you are interested in going or would like more information. This years featured townball game will be the Waseca Braves at the Austin Greyhounds at Marcusen Park in Austin at 7:30 p.m. on Friday, May 31 with a pre-game gathering at Piggy Blues Bar-B-Que (motto: Where you can eat pig or eat like a pig!) at 6 p.m. Contact Stew Thornley, 651-415-0791, if you are interested in going and letting him know if you can drive and take others or if you need a ride. Note: If the weather forecast looks bad, the outing may be canceled. If that becomes an issue, contact Stew the morning of May 31 to see what the decision is. In addition, some members are planning to go to a game in Waseca at 7:30 on Wednesday, June 5. Several members are already planning to attend the 2019 Black Sox Scandal Symposium at the Chicago History Museum to commemorate the 100th anniversary of the scandal September 27-29. The weekend will include a trip to a White Sox game, and several chapter members are now working on an article on the predecessor to the White Sox, Charles Comiskeys St. Paul Saints, which played in the Western League from 1895 to 1899. Details are set for the Minnesota 19th Century Base Ball Interdisciplinary Symposium, which our chapter will host in Minneapolis on Saturday, November 16. Bob Tholkes is the primary organizer and is working with the chapter Research Committee on the program. The symposium is a joint project of the SABR 19th Century Committee, the Halsey Hall Chapter of SABR, and Hennepin County Library. Have you attended a Minnesota college, and would you be willing to contact it about the possibility of integrating SABR into some departments? If so, please contact Membership Committee Chair Hans Van Slooten. Hans has written an article on SABR and our chapter for Twins Daily: Interested in Baseball Research? Join SABR! Tom Breen has a blank scorecard from the September 28, 1944 Service World Series game, part of a series of games held at Furlong Field and Hickam Field in Hawaii from September 22 to October 15. Anyone interested in seeing the scorecard may contact Tom, tbreen24@gmail.com. Johnny Vander Meer, Johnny Mize, Phil Rizzuto, Dom DiMaggio, Ferris Fain, and Joe Gordon were among the players in the game. 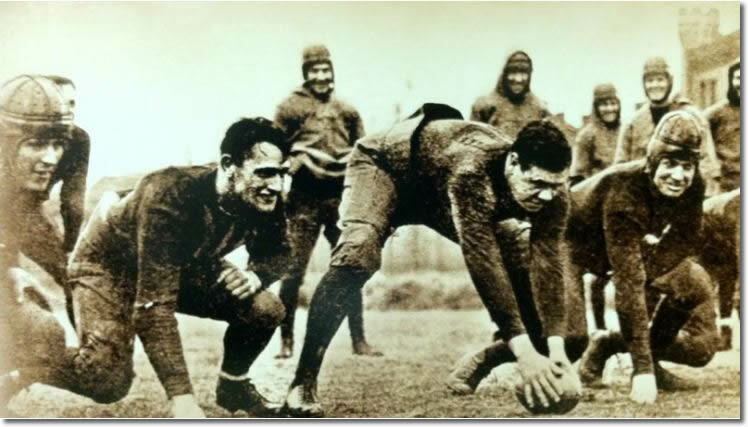 Matt Johnson came across this 1926 photo of Babe Ruth lining up at center (and/or blowing a fart) during a Minnesota Gophers practice, flanked by George Gibson, Harold Hanson, Neil Hyde, and Ken Haycraft. Wesley Ellingwood is producing a documentary about the rivalry between the Minneapolis Millers and St. Paul Saints. On March 31, the official scorer announced the pitching line for Clevelands Shane Bieber but gave the wrong first name for him. Guess what it was. September 26, 1964: Phillies Sixth Straight Loss Erupts with Ninth-Inning Fireworks and June 10, 1981: Nolan Ryan Gets Best of Pete Rose, but Phillies win Marquee Matchup by Steve Ginader. Jimmy Lee by Frank White. This was the cover story on the Winter 2019 Ramsey County History magazine. Jim Cox pointed out writing opportunities for the SABR BioProject, based on a March 9 article by Patrick Reusse in the Star Tribune about Twins folk heroes. Jim noted that many of them do not have bios on the SABR site. Members looking for a writing topic may contact a member of the BioProject staff. April 22Research Committee meeting, 7:00 p.m., Brookdale Library. For more information, contact Brenda Himrich, 651-415-0791, or Sarah Johnson. May 4Fred Souba Hot Stove League Saturday Morning, Bunnys, Minneapolis, 9:00 a.m.
May 17Reception for Alan Holst, 6:00 p.m. For more information, contact Brenda Himrich, 651-415-0791. May 18Spring Chapter Meeting, 9:00 a.m, Faith Mennonite Church, Minneapolis. For more information, contact Howard Luloff, 952-922-5036. May 20Research Committee meeting, 7:00 p.m., Brookdale Library. For more information, contact Brenda Himrich, 651-415-0791, or Sarah Johnson. May 31Townball, Waseca at Austin. For more information, contact Stew Thornley, 651-415-0791. June 1Book Club, Barnes & Noble, Har Mar Mall, Roseville, 9:30 a.m., Winning Baseball: A Simple Game of 10 by Les Gerdin. July 27Clinton LumberKings at Cedar Rapids Kernels. For more information, contact Howard Luloff, 952-922-5036. November 2Spring Chapter Meeting, 9:00 a.m, Faith Mennonite Church, Minneapolis. For more information, contact Howard Luloff, 952-922-5036. November 16, 2019Minnesota 19th Century Base Ball Interdisciplinary Symposium, Minneapolis Central Library. For more information, contact Bob Tholkes., 952-922-5036. Past issues of The Holy Cow! are available on-line.